[Caen, France] — The cold morning wind was biting our faces as we walked up to the big bronze plaque. Our incredible guide Mathias Leclère, whom we just met ten minutes ago, pulled us over to chat in the protection of a wall dug into the hill. “Over along that ridge, German troops lined the tree lines, all the way to that bell tower in that village over there. 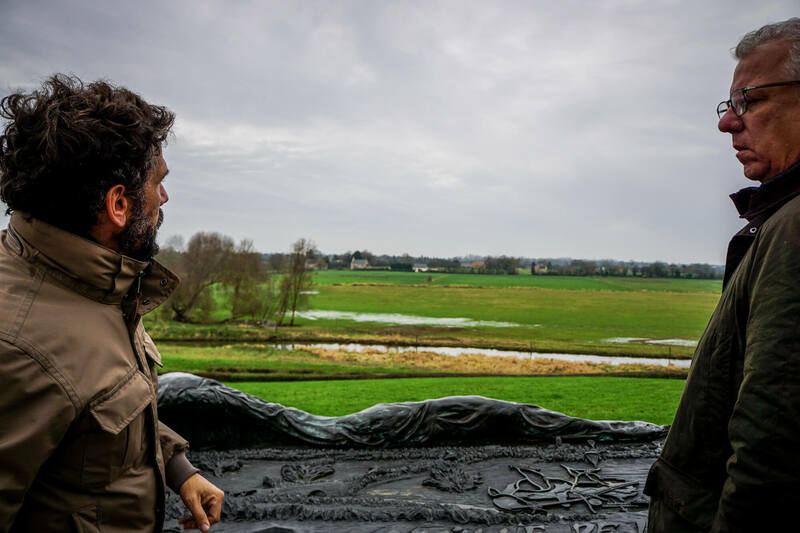 Below us, all of these fields had been flooded by the Germans in anticipation of an invasion.” Mathias calmly shouted amidst the blowing winter wind, a little sleet stinging our faces. “Just behind us, 13,000 U.S. paratroopers had just landed in the middle of the night. It was pitch black, no moon. The ack-ack anti-aircraft fire and low cloud cover had scattered them miles beyond the jump zone. Some landing hard with their heavy equipment in these flooded marshes and muck, many others landing in the middle of a German squadron behind us in Sainte-Mère-Église — just like you saw in The Longest Day. “That narrow road was the only thing elevated above the flooded marshes, making it critical to get troops off of Utah Beach. There was no other way out. But the road was totally vulnerable to German machine gun fire from the woods. Tanks, trucks and troops had only one way to go. It was a shooting gallery. The first man killed in World War II died right there trying to take that bridge, hours before the real invasion started. One legendary American soldier jumped in front of the on-coming German tanks on the left side of the bridge right there, fired his bazooka and took out the first tank, just feet away, then another, then another. It took four days of attack and counter-attack before the bridge was secured. Over three hundred men on both sides would die trying to take that tiny bridge and road. It’s hard to think that such a small river and tiny bridge could be such an important battle goal. I’ve always read about all the important rivers like Le Merderet, but when you see it in person, you realize they are just tiny canals. This was the site of the battle at La Fiere bridge over Le Merderet river. This cool plaque sheathed in a folded parachute, has an intricate map of the battle and 3D depiction of what happened here. This lays out the importance of these crossroads. To the Germans and Allies. Read more about this important battle here. It was cold, windy and rainy and early December when we did a four day tour of Normandy, not the most hospitable weather to be touring beaches. But my cousin and I had been wanting to take a D-Day tour for years and we didn’t want to put it off any longer. Also, we wanted to avoid the summer crowds. 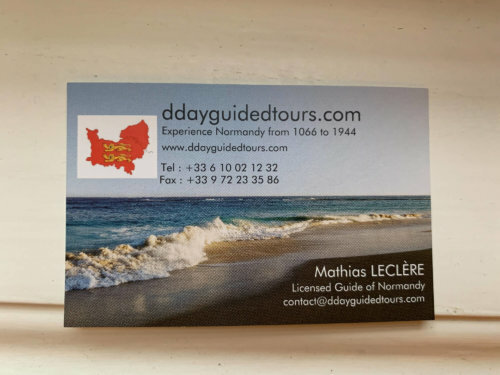 At first, we thought we’d just rent a car and drive around Normandie, look at the beaches and visit some towns to see where D-Day happened, but instead we hired an amazing historian: Mathias Leclère of D-Day Guided Tours. Oh man, what a great move. 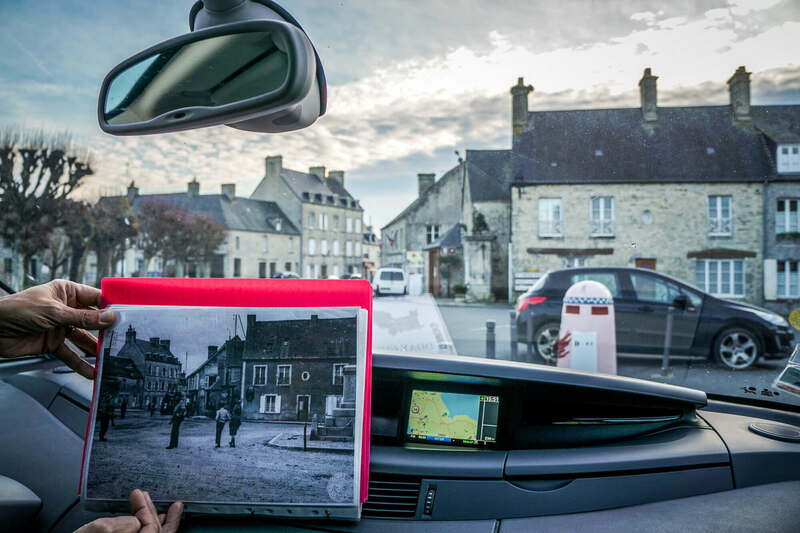 Mathias is from a small town outside of Bayeux, his grandparents owned a farm and had two German soldiers billeted inside their house for 2 years before Canadians liberated their family. Since then he has made it his vocation to keep the stories alive, to learn more and to teach what happened here. Not just a guide that points and says “this is where this happened,” Mathias knows every field, every battle and skirmish, every army company and commander. Not just a guide who points and says “this is where that happened,” Mathias knows every field, every battle and skirmish. We walked the bocage hedgerows where the worst fighting happened and pulled over along the backroads as he told stories of street-to-street fighting that happened in this beautiful land. And he choreographed our two days perfectly and dramatically. In logical and dramatic succession, laying the whole scene out chronologically, from pre-invasion to invasion, to days after. I spent years trying to piece it all together and in two days Mathias imprinted in my mind the whole scenario. I walked away stunned…amazed … mind-blown..emotionally drained. 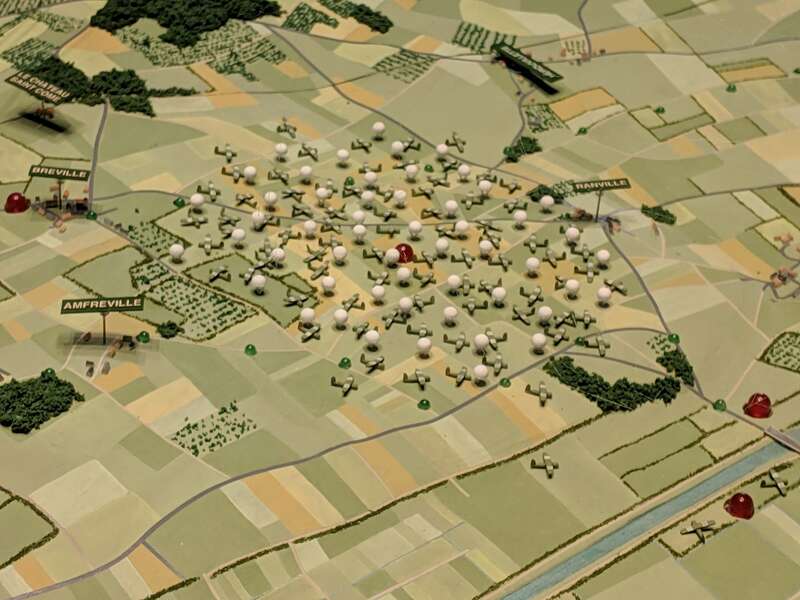 And what really blew me away was his insight on the planning, the infinite planning, that went into not just the invasion, but every single square kilometer behind the lines — choreographed down to the minute, months in advance. Endless things I never knew about. I always thought it was just “throw a bunch of men at a couple of beaches and have at it.” But there were millions of man hours spent in the many month build-up in England, each division commander given a plot of land and and a very specific objective, all rolling up into one overall plan. Just mind-blowing. Mathias, laying out all the landing zones at Omaha Beach; explaining every group’s mission, in the same place it happened. 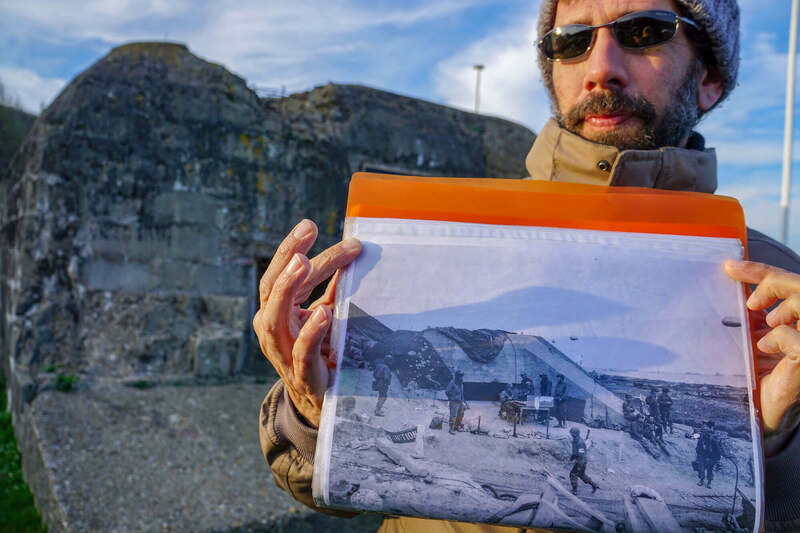 Mathias has dense knowledge of all the equipment, all of the bunkers and defenses, the troop companies and their origins, even the commanders and their individual personalities and personally knows all the local French townspeople and all they went through. Most importantly, Mathias has a knack for story-telling, not just spewing facts, but unrolling the events in a cinematic way; keeping everyone engaged, whether you’re into WWII or not. 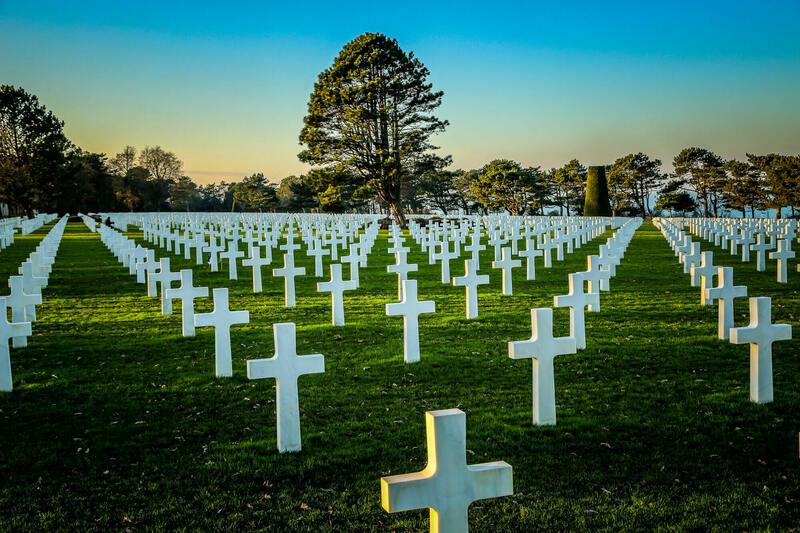 Starting with the opening beach battles, then visiting the towns impacted, then beginning the final day with a frost-covered morning at the solemn German cemetery and ending at a climatic emotional sunset at the American cemetery. My god, just gives me chills writing this. 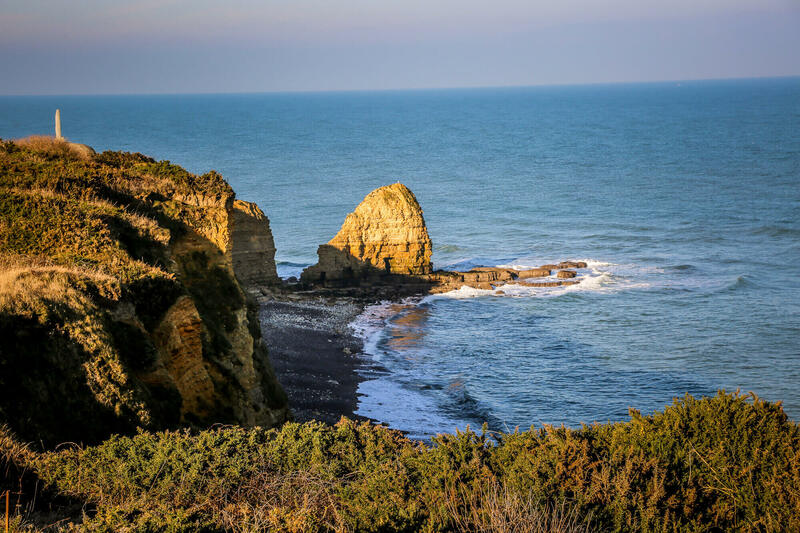 You can spend a week or a day visiting the D-Day sites in Normandie, often on a long day trip from Paris, no matter what you choose, all will be rewarding. But you’d be cheating yourself to only do one day. 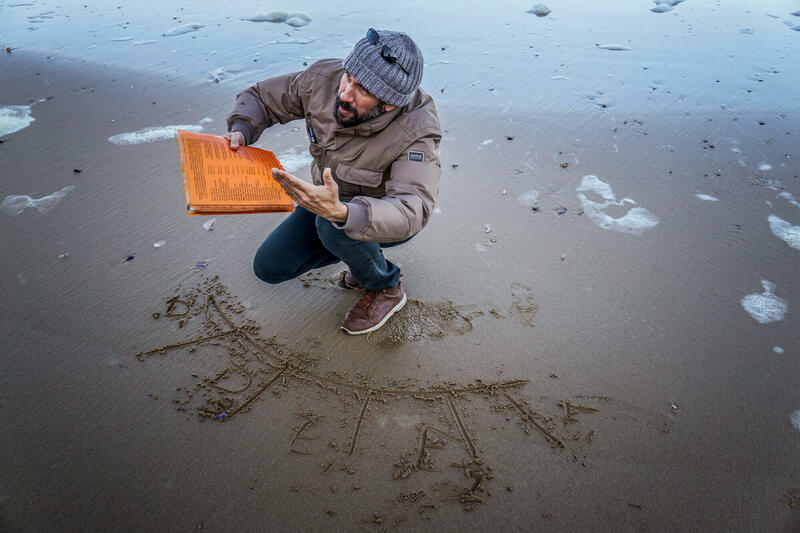 Definitely hire a real guide like Mathias to maximize the experience. 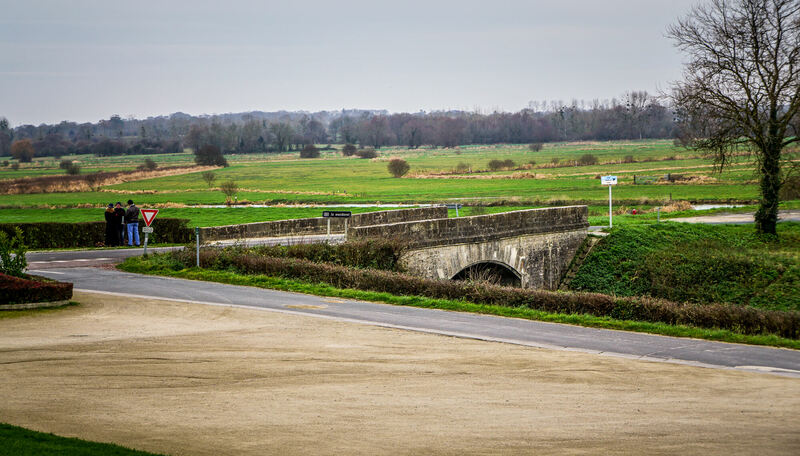 Our trip was four days, the first driving from Paris (you can take a train to Caen or Bayeux and then rent a car) on a self tour of Rommel’s German headquarters at La Roche-Guyon, the lovely port town of Honfleur, then an overnight in Caen. Two days of intensive touring sites with Mathias and then a last morning visiting the remarkable Caen Memorial Museum and the Bayeux Tapestries, before returning to Paris in a snowstorm. 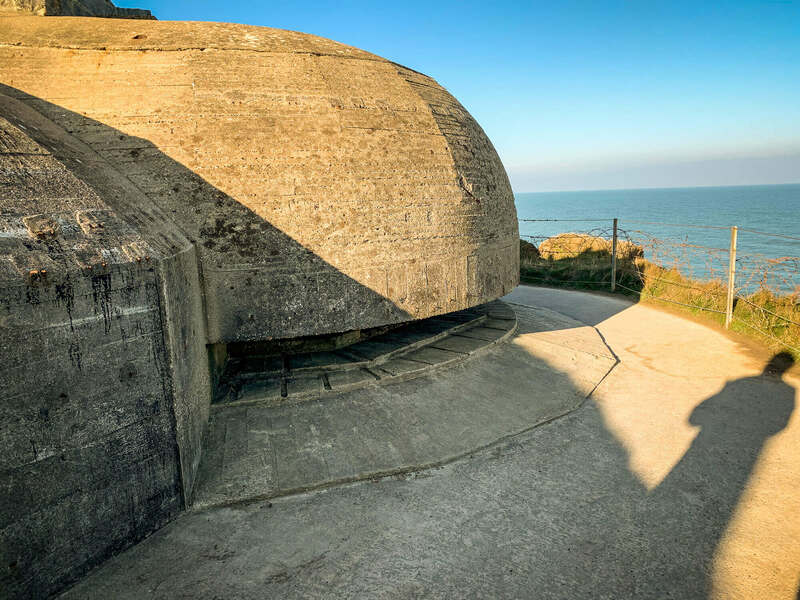 Here follows is a rundown of my favorite recommended sites to visit D-Day sites in Normandie. These were some of the most memorable days of my life. The critically important Pegasus Bridge was the site of the first opening shots of D-Day. There is a small museum and memorial setup by the British and Canadian forces who fought to take this famous bridge. I wasn’t expecting much when we pulled up, but it was a really amazing little museum. One of my favorite stops on the trip. The British Commandos were highly trained troops and the first to arrive behind the lines before D-Day invasion began. 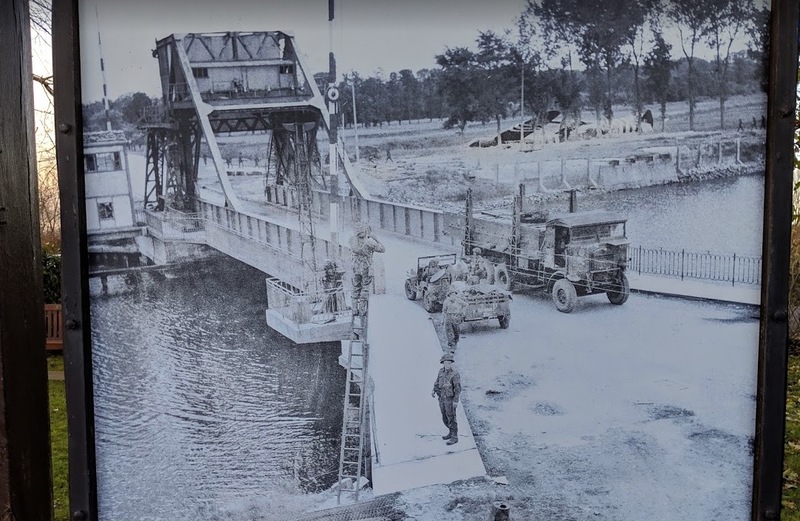 Hundreds and hundreds of wood and plywood gliders were tailed behind planes, then silently let go to swoop in to surprise the Germans holding this crucial bridge crossing a canal. Preserving this bridge was critical to moving incoming troops off the beaches and speedily crossing the interior. 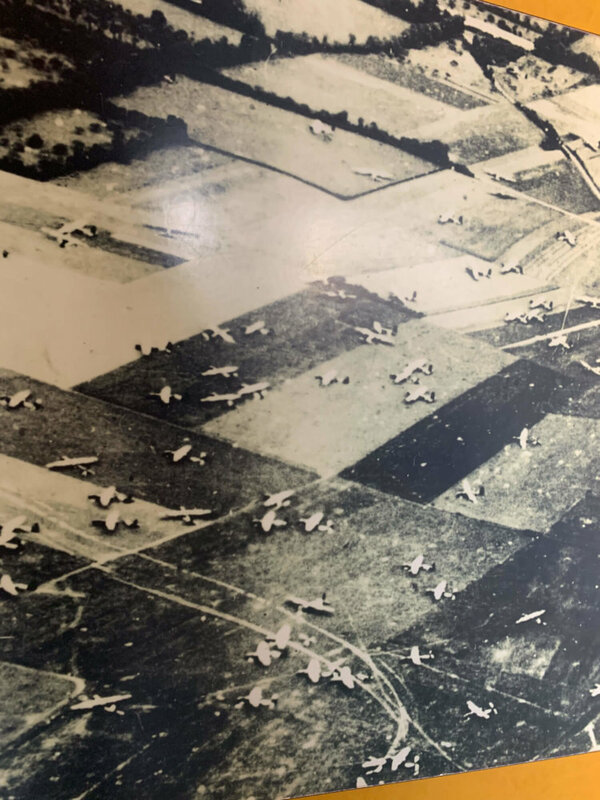 At first I thought this was fake, so many gliders plotted around in such a small area, but then I saw the real WWII photos of the same place. So many huge wooden gliders carrying troops, jeeps and canons, crash-landed in the fields surrounding this critical drawbridge. So many awkward wooden glides, landing so close. The precision landing of the main assault glider just feet from the bridge was the key to the surprise attack. One general called it the most important feat of flying of the entire war. This is the “real version” of what the 3D model above depicted. Hundreds of gliders landing in fields — in the middle of the night! — so close together. I couldn’t believe anyone could survive this. Here is a bootleg clip from The Longest Day, one of my favorite sections of the movie, that described this incredible battle. It’s just amazing to think these guys were some of the first to land in France, way behind enemy lines, way ahead of the soon-to-land army on the beaches. You hear a story and its one thing. You see a real photo and the massive scale just blows your mind. Look at all of the no-powered wooden gliders, all coming down and crash landing in such a small, tight area. How did they all not run into each other? Inside, some gliders had troops, some loaded with men. Others, cannons. Built of plywood, many men were hurt or killed as the jeeps came loose on landing and flew forward inside the cabins. 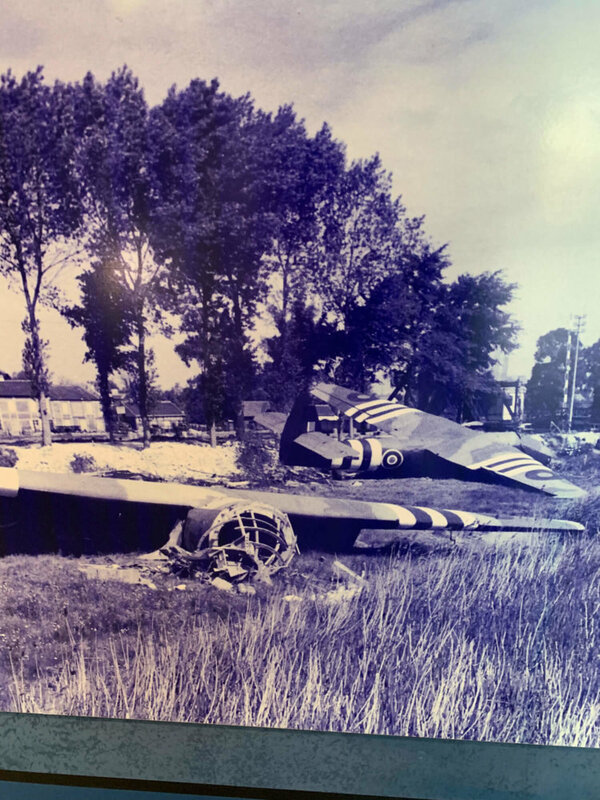 The main gliders landed so close to the bridge, the fighting so intense and such a surprise — the whole capture of the bridge took under 15 minutes. But the battle raged on for hours until reinforcements came. It’s amazing that these things could fly. Nothing more than wood and a joystick. You can get an idea of what these were like in the full scale replica. I read in one book before I got here that most of the D-Day troops carried just 22 squares of toilet paper. I was in shock. Even laid them out on my floor. I can’t even. I was relieved to see a full roll. Make sure you read the details. The barbed wire was like a remaining scar after stitches. Faded, but still there. 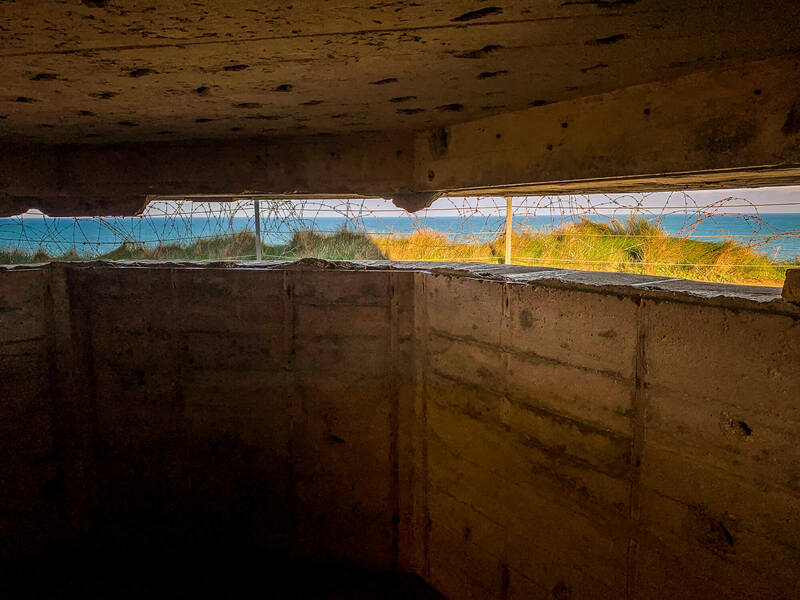 It all looks so pretty, until you realize these bunkers were slaughtering landing troops all up and down the beach. Mathias, ready to unwind another incredible story about the German gun batteries firing down Utah Beach. All of these bunkers were leashed on from battleships far out at sea, huge shells bouncing off their thick concrete backs. There’s a small museum you can visit (we had to skip) right on the beach. They had a monument and full size replica of the Higgins Boats — the landing craft that changed the way men battle. they have a full size replica of these wooden frame boats, built by the tens of thousands, that brought the troops to shore in the first waves. Can’t imagine how vulnerable it must have felt right before the gate dropped. Our most harrowing stop was visiting Pointe du Hoc and its entrenched German bunkers and cannons. For those who don’t know, this section of the DDay liberation was one of the hardest fought. The greatest, hardest, most badass task assigned on D-Day. 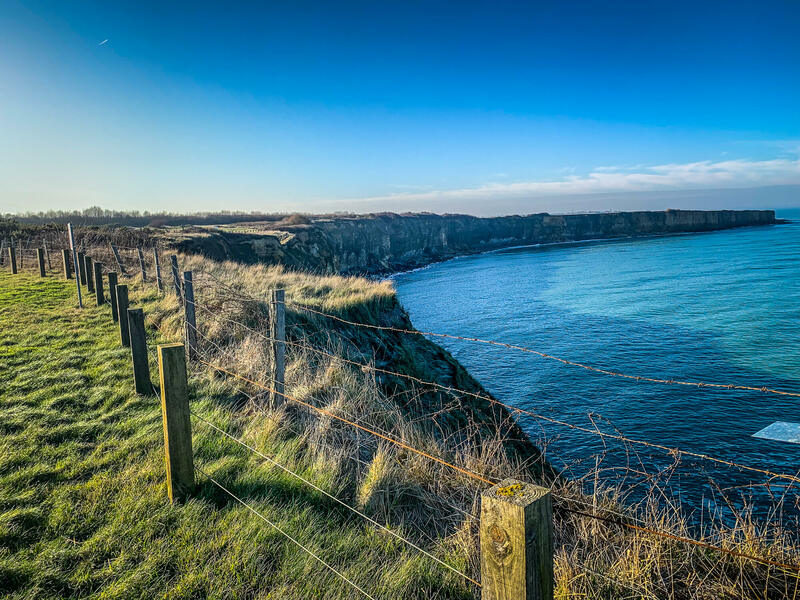 Undermanned, sea-sick, young soaking wet Army Rangers had to climb straight up 150ft cliffs, pounded by machine gun and mortar fire from above, using their teeth to hang onto ropes, while firing with their other hands, sticking daggers into the walls to inch up this horror. They had a half hour to do it. I can’t imagine the fear raging through the Rangers’ brains as their landing craft approaching this beast. Obviously, the hardest task assigned in WWII. 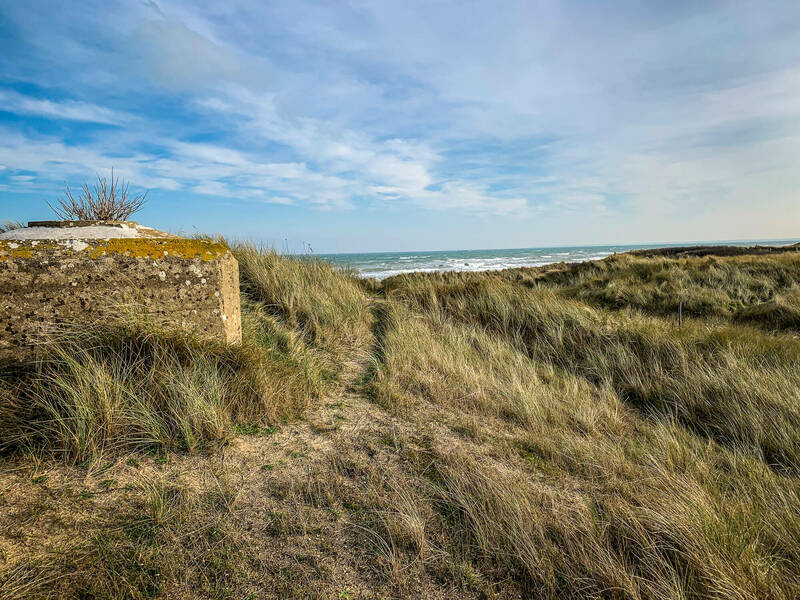 Arrive on a narrow beach, shoot ropes and grappling hooks over the barbed wire edge, then climb up 150ft on ropes, firing UP, whilst Germans were firing DOWN at you. You can really see the crazy height of these steep cliffs, men having to scale them to silence the powerful gun batteries that can take out ships miles at sea. You can see all the bomb craters, most doing to silence the hell build below. It’s amazing that after thousands of tons of bombs being dropped on this hilltop, some of the bunkers remained unscathed. They bounced right off. This view was really terrifying to me. You can just imagine how scared both sides were. One looking out, through the barbed wire, not knowing what was coming over the top. Or, outside facing in, seeing a violent wall of machine gun blasts coming from the invisible soldiers inside. These guys were badass. You had to have good teeth to become an Army Ranger. Seriously. In training, they were taught to hang by their teeth climbing the thick ropes so they could hold on with one hand and fire with their other. 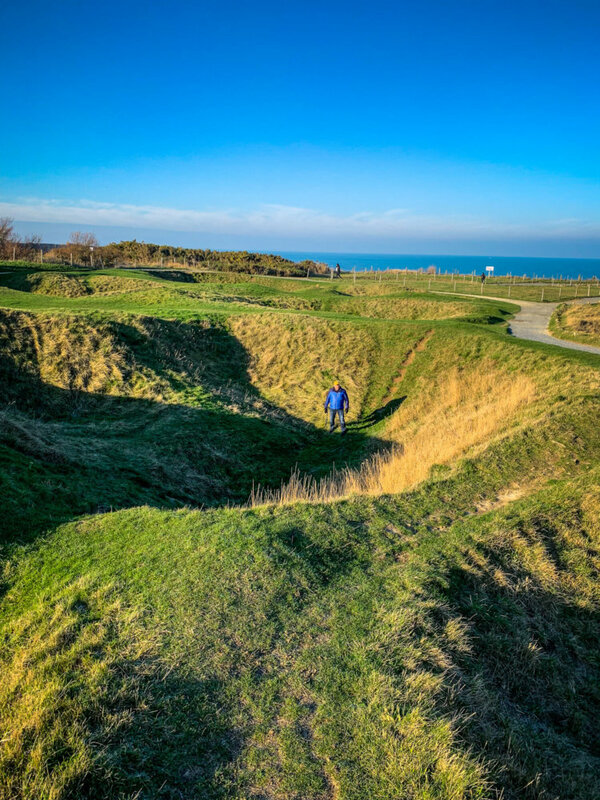 The Allied air force had bombed this place for weeks, hence all the giant bomb craters, but they did little damage to the thick concrete bunkers and tunnels and the Rangers overcame amazing obstacles to get the job done. I feel so small. It’s amazing what man can build to destroy. And what man can do to eliminate it. After weeks of pummeling, the bunkers were still intact. I couldn’t believe the size of the bomb craters. (Cousin Joe used for scale). This areas looks innocent enough when you first arrive. You can see how many giant bombs hit this outcropping, but barely scratched the German bunkers. I can’t imagine the German’s could hear very well after these massive bombs hit. 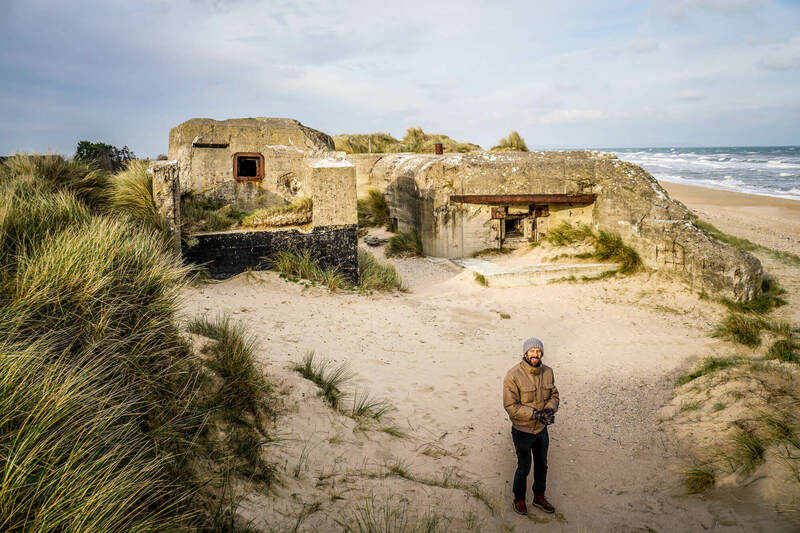 You can see some of the bunkers were built later, when Germany was running out of time and money. They used cinderblocks instead of cast in place concrete. Just standing here, you can almost hear the terrifying sound of German machine guns. Here’s the official account of the battle from the Battle Monuments web page. And from the Army history website. And on the D-Day Overlord website. And TripAdvisor’s comments on how to get there. The remnant of the war are everywhere and have not been forgotten. Even in this pretty seaside town, with lovely houses on the cliffs, they not only look over the gentle surf, but the German bunkers pointing straight down the length of the beach. People run about their errands, stop for lunch, jog along the beach, right alongside dozens of memorials and plaques remembering those who have fallen. 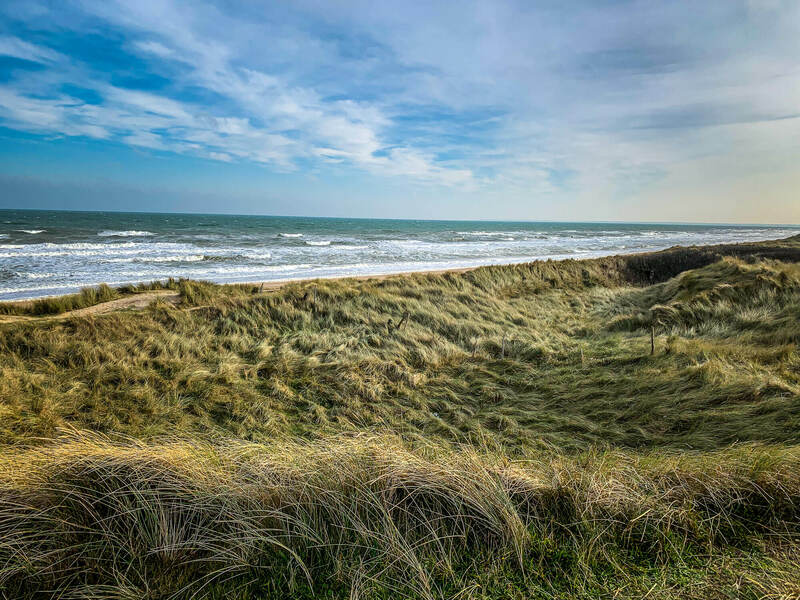 My Mind Print of Omaha Beach was skewed by the beaches they showed in The Longest Day. In the movie, this was a vast gnarly beach with troops rushing across great sand beaches. What I wasn’t expecting is what a beautiful beach town it was. 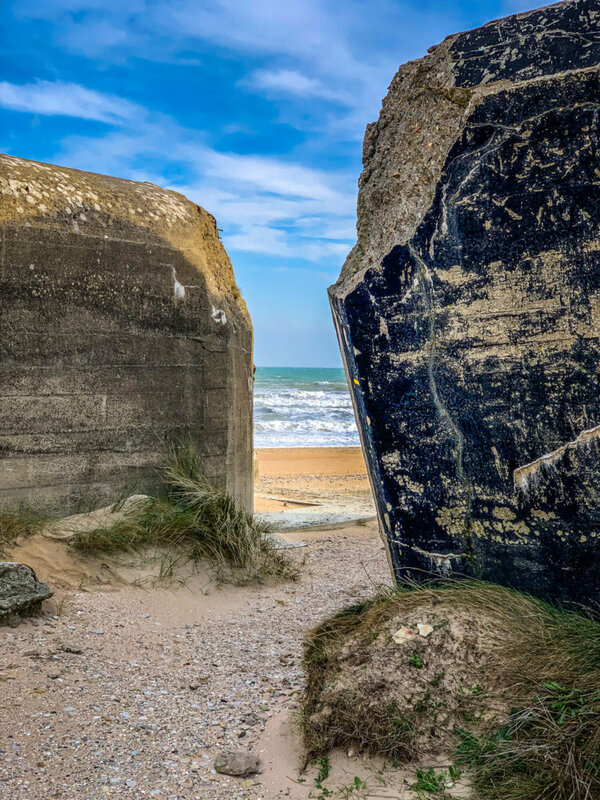 The beach shallower at high tide — the Allies chose the exact die based upon the tide being out, exposing more of the beach to give them room to unload. Amazing that so many died crossing such a short stretch of land. 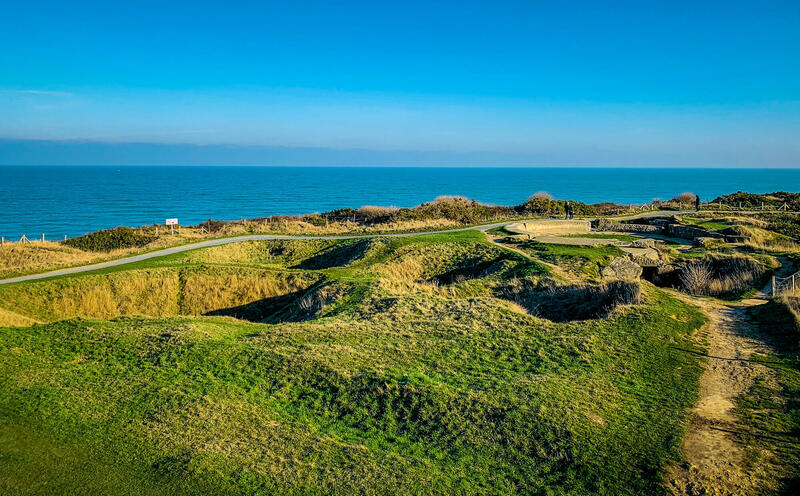 If it weren’t for the bunkers and memorials, you’d never know such carnage was in such an idyllic place. As opposed to my memories of movies, this wasn’t some wide barren beach, but a thriving beach resort, with a seawall that troops had to get up and over. Much different looking than in the movies. Part of the tour was crisscrossing the backroads behind the beaches, visiting small towns, pulling off the side of the road in the middle of nowhere to see where an important skirmish happened or a Medal of Honor was deserved. Mathias the whole time, working his magic book showing a THEN and NOW comparison that makes everything so real. Especially the Allied destruction of all the French villages, sometimes needlessly. 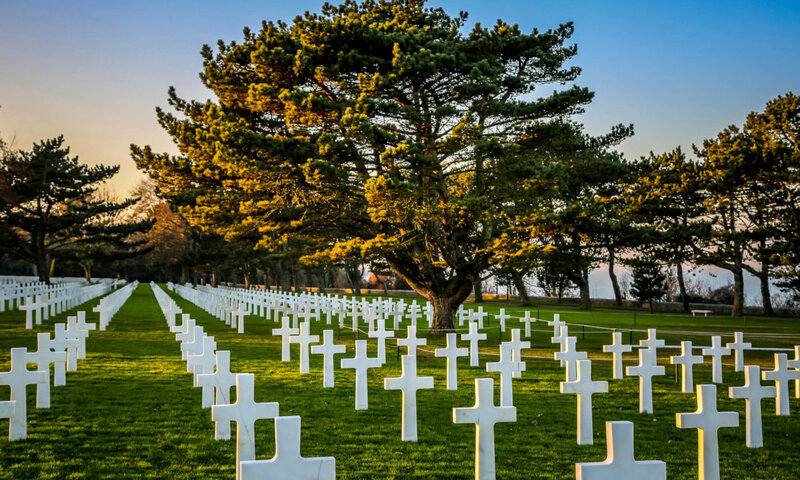 There were more French people killed on D-Day than Allied and German soldiers, combined. Fascinating story of two American doctors in this town o Angoville. They holed up for days, doing triage on both American and German soldiers. You can still see blood from the wounded stained into some of the church pews. 75 years later. Even though the village people suffered more that the liberating troops, their gratitude is forever. Even the stained glass windows of the main cathedral was changed to thank the airborne troops that saved them. This one was my favorite. Look closely at the details. Like a mini biblical story…of a battle of biblical proportions. These cows were a need break from the intensity. The Normandie breed of cattle are prized for their milk. No doubt due to the lush grasses and constant rain. The grass still bright green in December. 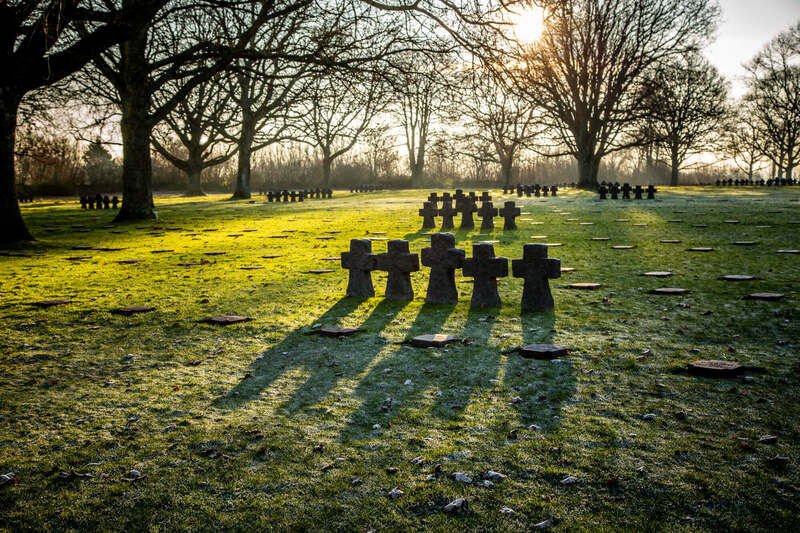 When I heard we were going to the German cemetery, I was like “meh, don’t need to see that.” But when we arrived on a frosty December morning to this wretchedly solemn place, with brooding, epic tombstones protruding in the morning sun, my heart stopped. We were one of he few people there, the silence and the sun making everything more dramatic and impactful. Mathias’ timing of being there at sunrise was brilliant, look at pictures on the web of any other time of day and it looks completely different. My god, I’ve never experienced architecture that was so moving, so solemn, so emotional. Anywhere. Just takes your breath away..
As defeated in the war, the soldiers remains were often stacked two deep, in tighter spaces. So many incredible stories, so much heartbreak and valor. 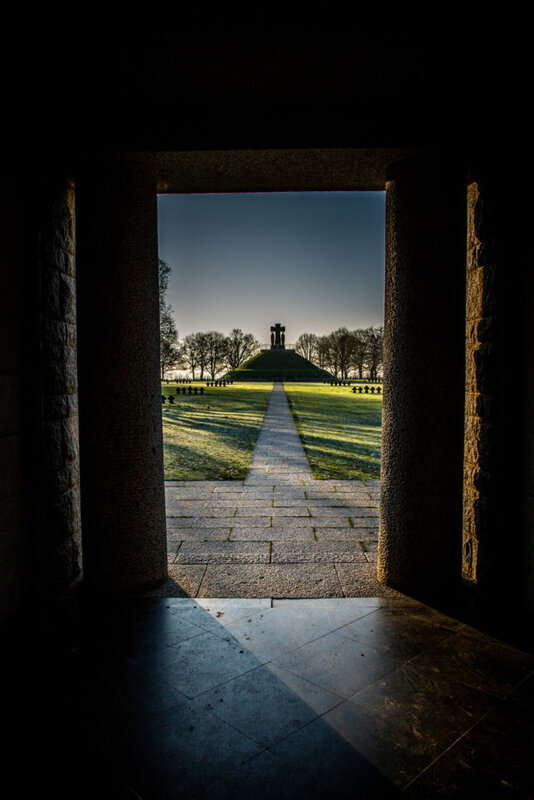 Starting at The German War Cemetery on a frosty cold morning and ending at sunset at the flag lowering ceremony at the American Cemetery. What a horror it was for everyone involved. The Caen Memorial Museum is an incredible museum. At first, I said “Naw, we don’t need to see a museum full of uniforms and posters.” but man, was I wrong. My friend’s father said it was a must, so we made sure to tour before we left Normandie. Wish I had more pictures, but just go. 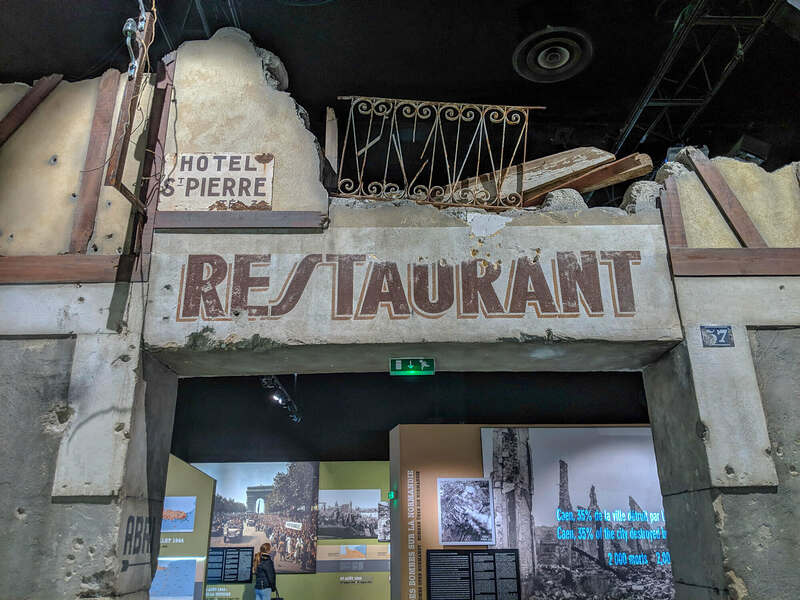 So well designed, what this museum does so well is piece everything together for your, particularly the lead-up to the War, what was happening, why it was a problem, what events triggered this massive world war. Totally fascinating, incredible treasures inside. The famed captured Enigma machine that helped us break German code and listen in to their plans. This one instrument probably won us the war more than any other device. La Roche-Guyon is famous for being Rommel’s command post for the duration of the European War. About an hour from Paris and a stop along the way, it’s worth a short visit — although the day we were there, they happened to be closed. 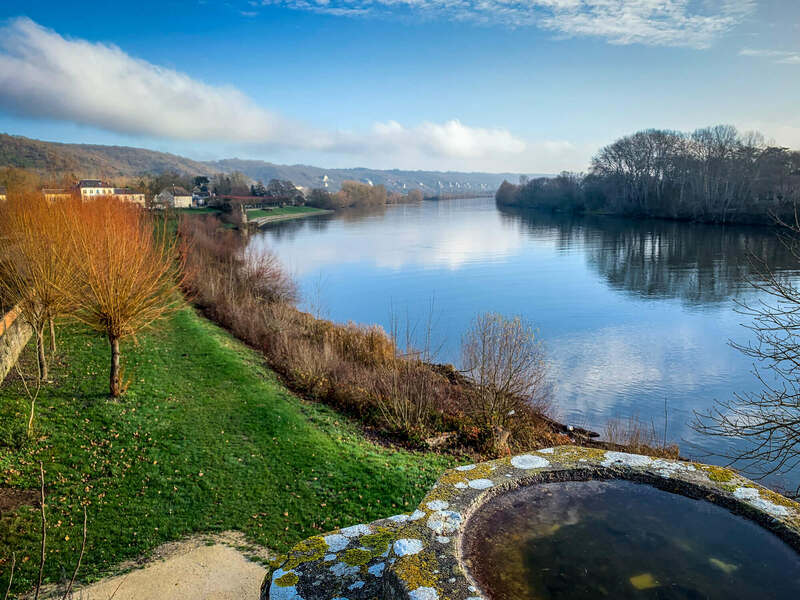 Located on a strategic (and beautiful) bend in the Seine, this place has been a critical military outpost since the Vikings (The Norse Man part of the name Normandy) when they first rowed their longboats up the river. From this strategic vantage point, you can stop invaders from roaring up the river, in either direction. 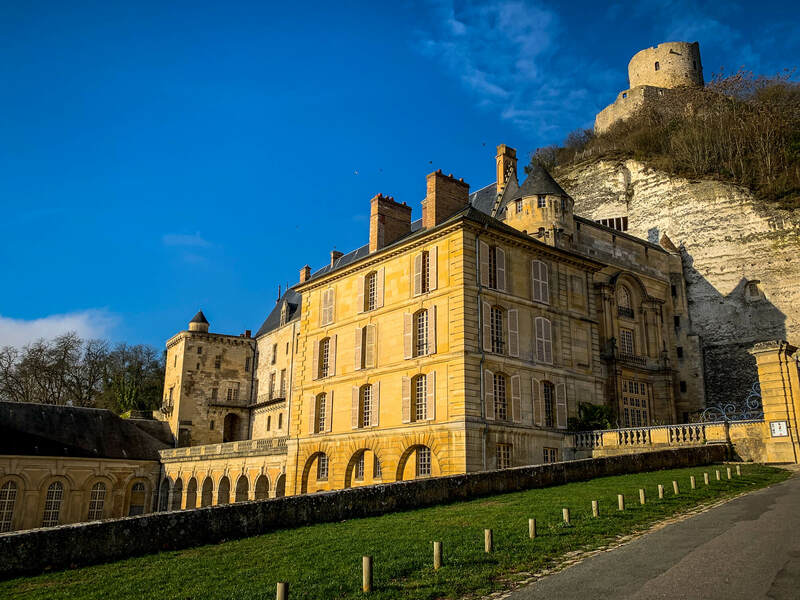 Ancient caves are dug into the chalky hillside, then an 18th century palace was added on. Understandable why Rommel picked this as his headquarters. Cute little town to stop for lunch, too. It’s also right next to Giverny if you want to stop and see where Monet painted his water lilies. 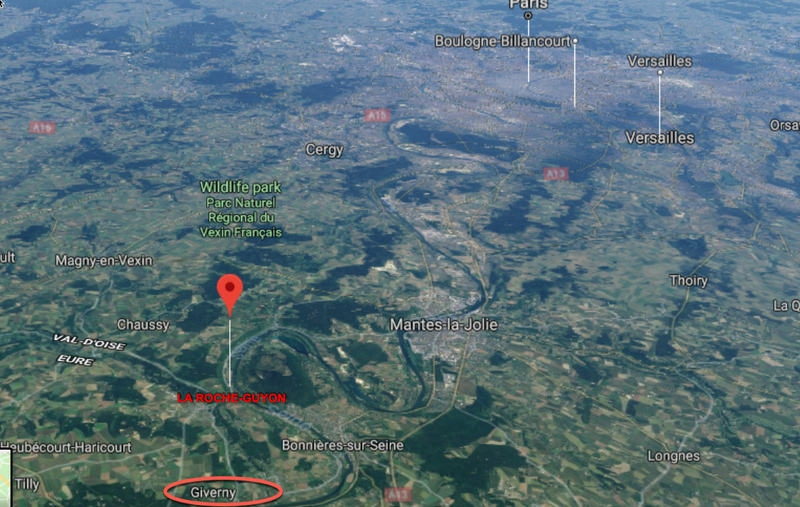 Here is some more info on La Roche-Guyon. And here. Mathias Leclère’s business card is below. Here is his awesome website. Make sure you click on his cool interactive map that calls out all the important sites. To give you the lay of the land, here is where all the towns are that I described above. 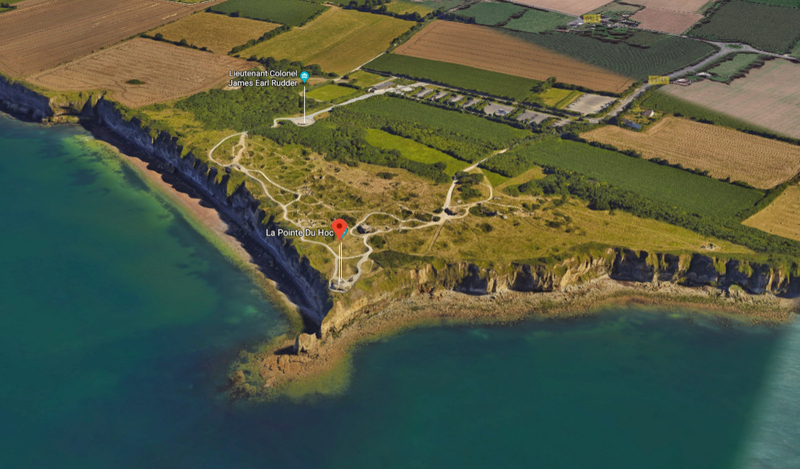 Here’s a Normandie Guide website. Here is chipper Rick Steve’s Normandy Guide. 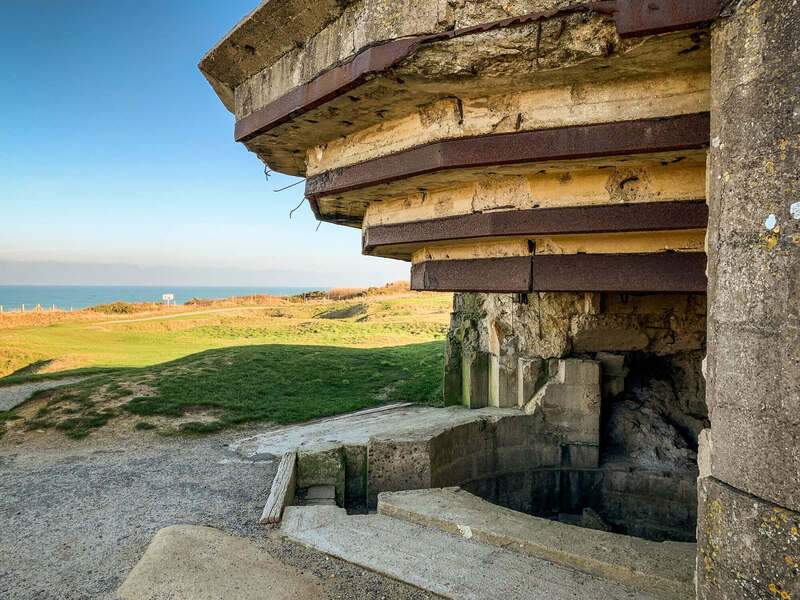 And TripAdvisor’s Guide to Normandy D-Day sites. And a guide from the 60th D-Day Anniversary from The Independent. 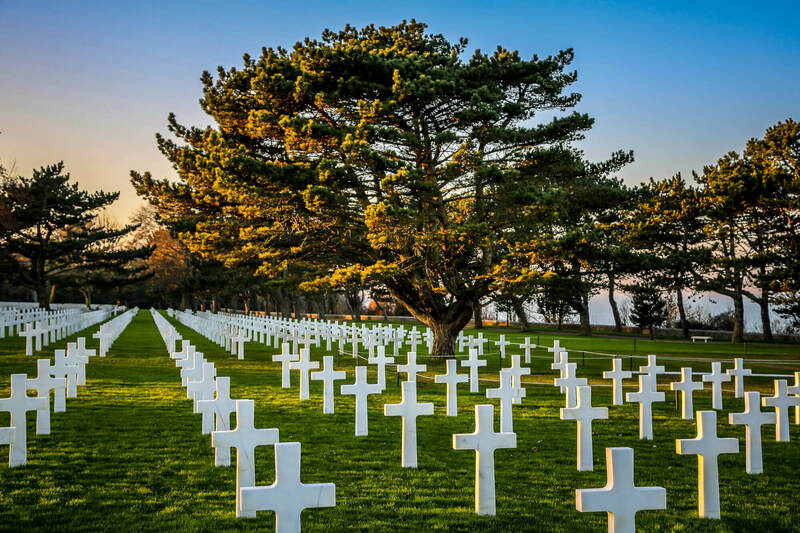 Here’s a great D-Day Guide I should have read beforehand from Conde Nast Traveler. And for general Normandy info. Here’s a guide from Vogue. And a Normandy guide from The Independent. And a Normandy Guide from Conde Nast Traveler. I am breathless. What a beautiful tribute and look at this very important piece of history. As always… job well done. Thank you, Cathy. This was one of the most memorable trips I’ve ever taken. 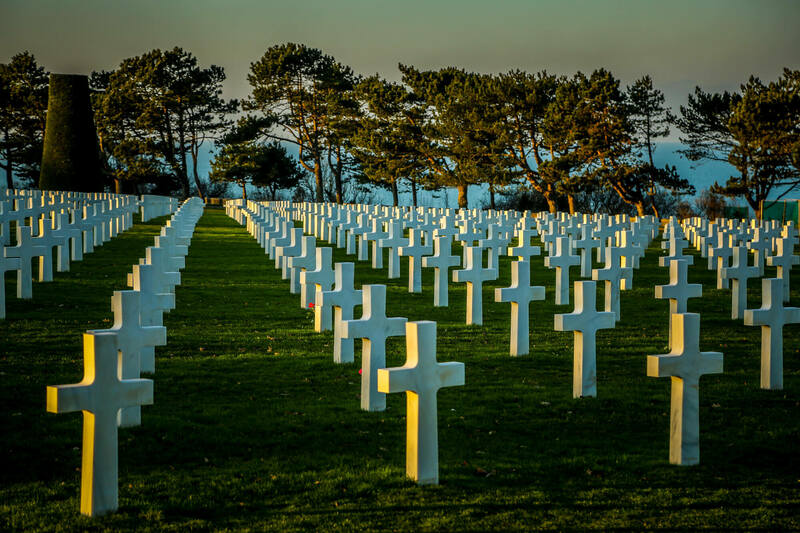 Whether you’re into D-Day stuff or not, it will leave you breathless. This guide was Everything. Thank you for your comment, Pete.